I just finished watching a documentary which I believe is absolutely imperative for every artist to watch. 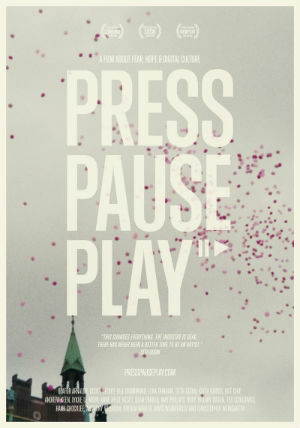 PressPausePlay. (It’s currently a free download with a very cool interactive player). It’s a fascinating look at the world of digital media, art and creativity from the perspective of some amazing artists. Musicians like Moby; commercial production artists like the folks behind Shilo; NY Times best-selling author Seth Godin; RED Cinema’s product marketing manager Ted Schilowitz; Behance co-founder Scott Belsky; and many more. There are easily two weeks worth of blog posts spinning around in my head from this film. So be prepared. But the one I want to start with is actually an excerpt from the full interview with techno musician Moby. He was sharing about a conversation he had with designer and artist Paul Frank. Paul told him what Moby believes is the best piece of advice he’s ever received about being an artist. “Make stuff for your friends.” That’s it. Make stuff that you and your friends will like. It seems like such a simple thing, but how many of us try our hardest to make stuff that we THINK other people (not necessarily our friends) will like. We’re striving to be the kind of artist that so-and-so is, ignoring our own muse in favor for that other guy’s muse. Who’s that other guy? You know who he (or she) is. He’s that multi-award-winning (most likely Australian) photographer. He’s that filmmaker that gets 2 million YouTube views in two days. She’s that musician who’s latest EP was downloaded 10,000 times in one day from NoiseTrade. It’s the person you so long to be but THINK you’re not. But what if you took Paul’s advice to heart and just focused on making stuff you knew your friends would like. That advice is actually exactly what the late Steve Jobs said in an interview about he and Wozniak’s creation of Apple. They just wanted to make stuff they liked. So here’s my challenge to you (and me). Go out this week and do something that you know your friends will like. Listen for YOUR voice and to hell with that negative voice telling you what you like isn’t good enough. Then do it again the following week. And so on. Who knows. Maybe you’ll actually discover your own style. There are so many more juicy tid-bits from this Moby interview. I promise it’ll probably be the best 10 minutes you spend today. Can’t wait to see this film – been waiting since I saw the trailer… So very true – and I think when we sit around worrying that we’re not going to be as “good” as our inspirations have been-we forget that we’ve probably been someone else’s inspiration in our own process.